There you have it! The truth is finally out. When it comes to tablescaping with children in mind, I’m like a man in Victoria’s Secret at closing time on Valentine’s Day: I haven’t got a clue and I’m desperate at best! Yes, I have a child for whom I threw parties of all kinds when he was growing up, but I never felt quite comfortable with the whole process. Kids are fickle. What’s “fly” today is “whack” tomorrow. (Even those terms are probably “whack” by now!) Who knows what will make me the cool grandma? This week I am challenged…and I do mean CHALLENGED…with creating a tablescape for a group of “tweeners.” (For those of you like me who would have to look that up, that means kids at that age somewhere between little kids and teenagers. Middle schoolers, I suppose.) These kids don’t want to be babied, but they’re not ready for a glass of wine with dinner, either. They don’t believe in Santa Claus, but they still have a bedtime curfew and have to be reminded to wash behind their ears. You get who I’m talking about. 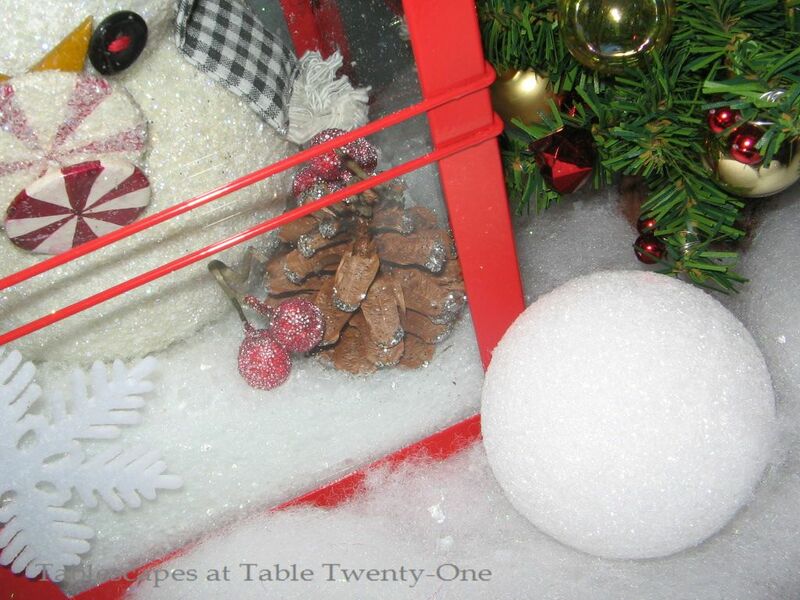 So…..
Frosty sits in his sleigh at the front door to welcome our young guests! 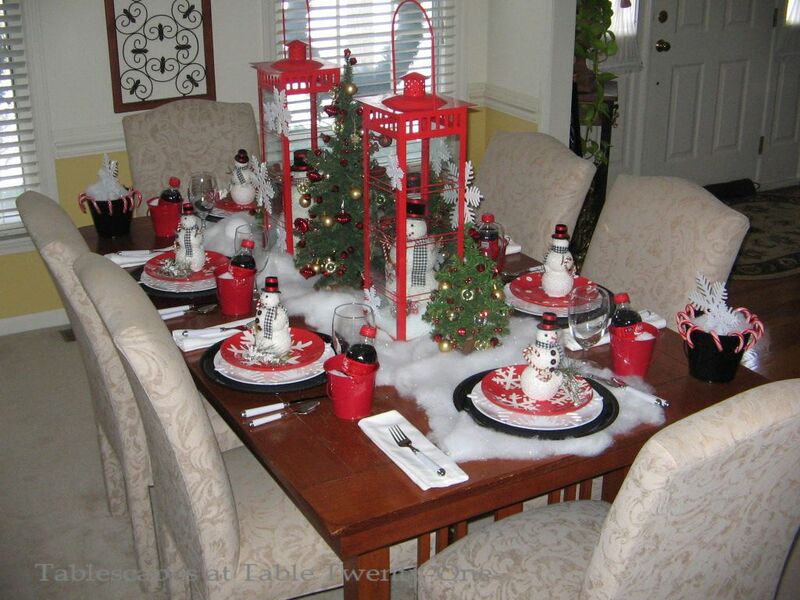 Cheery red, snow-white and chimney black are the predominant colors used for this “tweeners” Christmas luncheon. 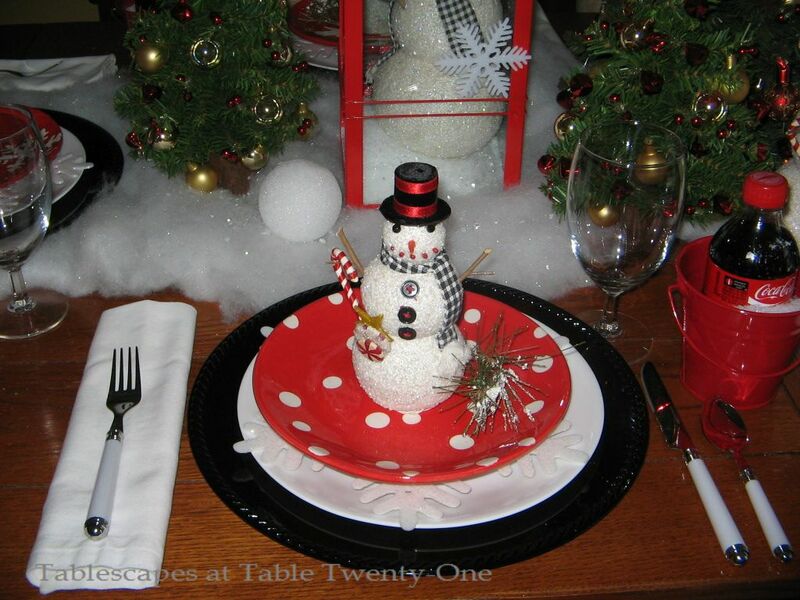 Each place setting consists of a black acrylic charger topped with a white plate, a frosted snowflake, and a cheerful red & white Hallmark salad plate in one of four designs. A happy little snowman with a sprig of seasonal greenery tops it all off. White cotton napkins, everyday stemware, and simple white flatware complete the setting. I used these same red buckets over the summer for a picnic. For these photos each is filled with faux snow, but we’re expecting frosty weather to move in so each will be filled with the real thing to keep the Coca-Cola icy and refreshing. 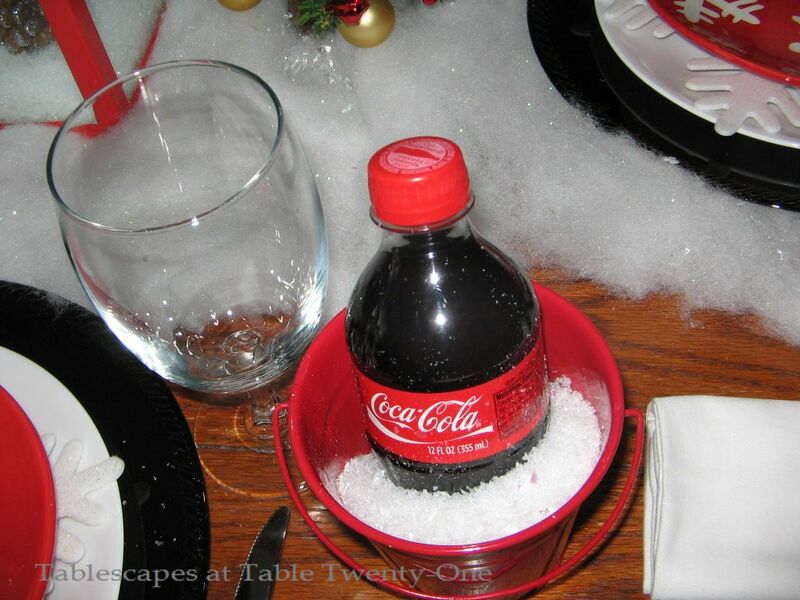 Using foods or containers with coordinating hues (like the red, white & black of the Coca-Cola bottle) is a great way to add color to the table. Shiny black buckets with tasty candy canes are decorated with faux snow and shimmering snowflakes that are smaller versions of the snowflakes at each place setting. The buckets are placed on opposite ends of the table. Snowmen in the lanterns, clad in jaunty black & white gingham scarves, are surrounded by mounds of snow and other seasonal elements. On the outside of each lantern are additional snowflakes that resemble falling snow. Styrofoam “snowballs” are scattered about the blanket of glistening snow. The luncheon table is fun for the young people with all the red & white. 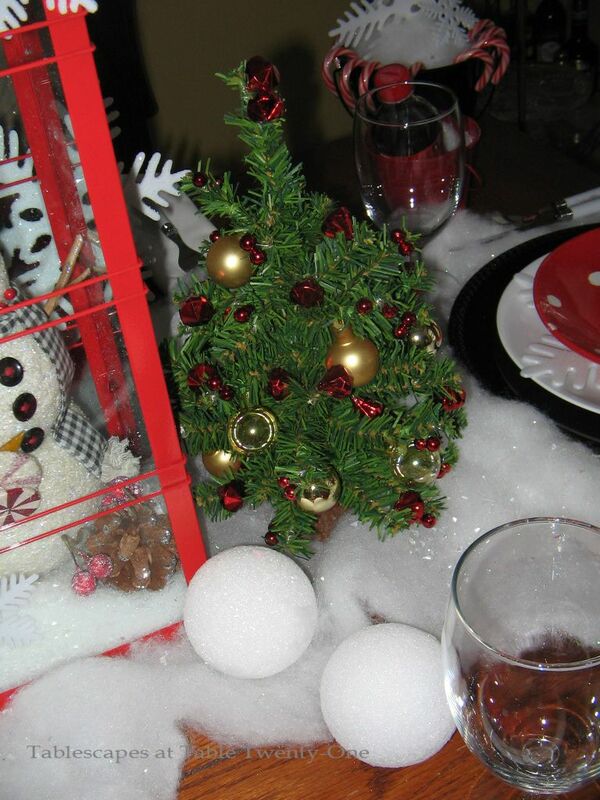 The miniature trees decked in red & gold coordinate perfectly with the red & gold-laden lighted greenery on the buffet behind the table. After the luncheon, we adults can enjoy the buffet decor on into the evening with the help of warm multi-level candlelight. 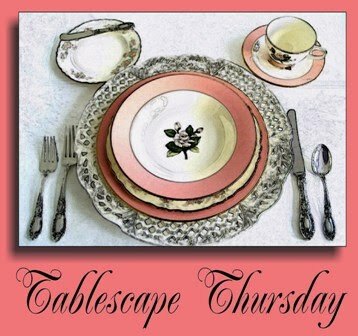 I am once again this week pleased and proud to join Susan and tablescapers from all over the world for Tablescape Thursday. 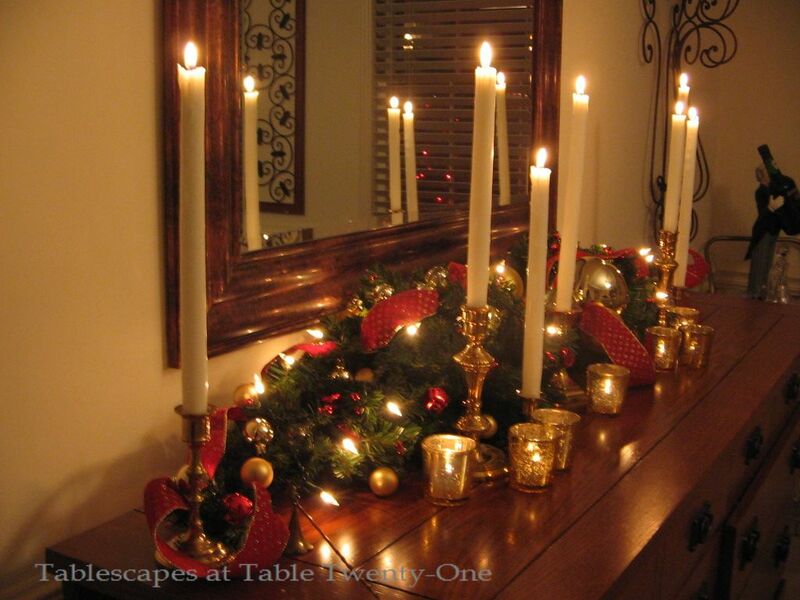 After you check out my photos, feel free to slide on over to get more great tablescaping ideas! Alycia, this is fabulous.. 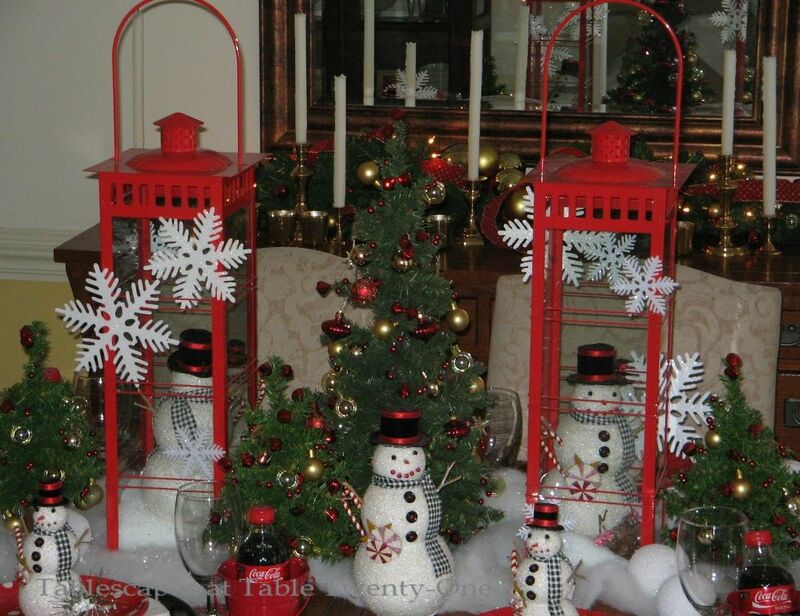 I love those lanterns and the snowmen are perfect. Your red polka dot plates are deeevine!!! I think using the styrofoam balls as snowballs is actually quite clever. i would never have thought about that. You are so creative. Love the table and the buffet too. Marlis! Hey!!! How are you doing? I hope you’re ready for Christmas! I know it has been wild for a lot of people…me included!!! 🙂 Thanks for taking a look at my post tonight, and I’m glad you like it. I’m scurrying about trying to get everything ready for tomorrow’s luncheon AND last minute baking, etc. We’re having dinner on Christmas Day at my son’s house, so I’m off the hook this year! Hooray!!! I hope you and yours have the best ever! I’ll see ya later! Thank you, Kelly! I hope you and the family have a fantastic Christmas and that you don’t have to WORK on Christmas Eve or the day after so that you can enjoy it fully!!! A floral designer’s work is never done, though, I suppose! 🙂 Have a great one! Oh what fun! Such an adorable table. 🙂 I missed the progressive dinner post until now. Love the bottle “wraps” there! I SO enjoy seeing your creativity at play! Love your lanterns & your bucket with real snow icing down “the real thing” will be a hit with tweeners as much as it would be for me 🙂 I hope you & your family have a wonderful Christmas! Oh such fun for any age! Thanks for so many ideas and inspirations! What a fun table! I especially love the Coke in the red pails! The snow looks so cool too. I could have put real snow in, we got dumped on so badly yesterday! Hope you have a very Merry Christmas. Everything is so cute. I have snowman plates but that is far from snowman plates. I bet they loved it. This is adorable! I love all of the snowmen,and I love the coke bottles in the “snow”. My goodness, Alicia, for someone who says they aren’t comfortable tablescaping for kids, you sure are TERRIFIC. Thank you, Debbie! I needed that extra validation! We’ll see what the kiddos think tomorrow! 🙂 Have a wonderful Christmas!!! If this is flying by the seat of your pants, I’d say you brought it in for a smooth landing! I think this is about the cleverest ‘scape I have seen in a while — and I think my family would enjoy it even though there are no kids! Miss Scribbler, you are TOO sweet!!! Thank you so much! The luncheon is (mercifully!) over now, and the kids had a great time. Aside from one small ketchup blotch on the carpet, everything went well. I have reclaimed my home and am ready to relax! Have a great Christmas, and thanks for stopping by! Alycia, you were right on with this table. It has been such fun seeing your creations in recent weeks. Happy holidays.